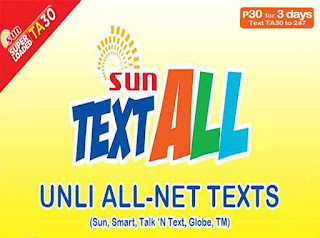 Sun Cellular prepaid subscribers who are looking to register a promo that offers unlimited text to all networks may try TA30. For only 30 pesos you can already enjoy unli-texting to any mobile network in the Philippines. You can text your love ones without worrying your regular load balance being consumed when you text to Globe/TM and Smart/TNT SIM users. As long as you have maintaining balance you can continue texting all day and night for 3 days. 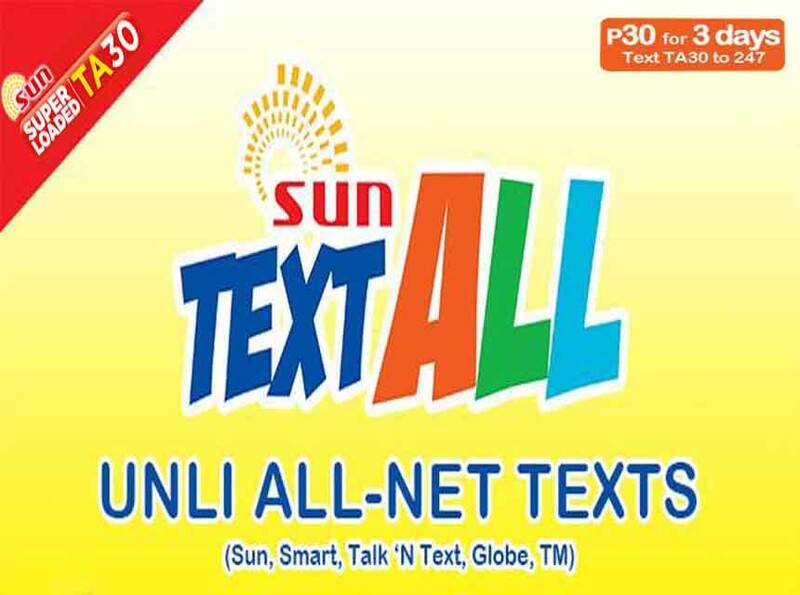 Another good thing to Sun Text All 30 or TA30 promo is that it includes free Facebook and non-stop chat with select mobile apps. Chat apps include Viber, Wechat, Line, FB Messenger and WhatsApp. This promo is available on Xpressload and load conversion method. If you want to register on your own, just use the keyword and format provided below as your reference. You can also ask your load retailer to direct the load to your mobile for less hassle on memorizing the send to number and code. This promo is also available for 15 pesos with Sun Cellular TA15 with free FB. They also have CTU30 unli-trinet calls and all-net texts for 30 pesos. You’ll receive an SMS notification from Sun Cellular after your successful registration. To use mobile internet while you are subscribed to TA30 promo, just turn on your mobile data then open the app to start browsing and messaging. Make sure you select the correct Sun APN on Settings of your phone to avoid problems in using mobile internet.